Sl st or whip stitch the right and left sides together to form a round popsicle stick. Finish off. Whip stitch the two popsicle pieces together, leaving the bottom open and turn inside out. Stuff with fiberfill. Next, tuck in the popsicle stick and whip stitch the bottom closed. 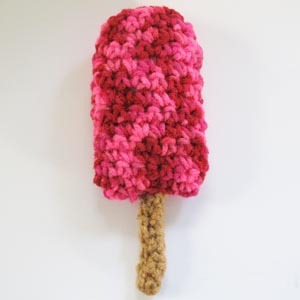 This entry was posted on Thursday, May 17th, 2012 at 12:05 PM by Emilee Gettle	and is filed under Free Crochet Patterns. You can follow any responses to this entry through the RSS 2.0 feed. You can skip to the end and leave a response. Pinging is currently not allowed. Adorable!! I love this project!!! Super-Sweet!